Nobody likes bandwagon fans. That's a fact. Have you been to see the Blackhawks play at the CTC lately? Seemed like there was an unlikely number of Chicagoans in town, didn't it? And their jerseys seemed pretty fresh and crisp, didn't they? Okay, maybe it's not quite that bad. This season has been a mixed bag so far. The Sens have mostly just been mediocre, with some impressive victories and some inexcusable losses mixed in just to spice things up. 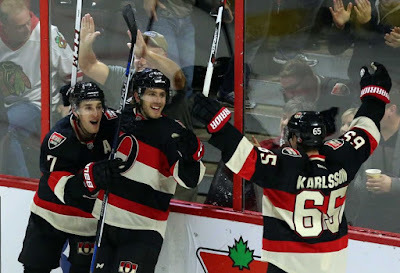 If I'm looking at the glass as half full, the Senators' best players have been their best players, and it's actually possible that adding a couple more good players could turn them into a legitimate contender. If I'm looking at the glass as half empty though... Melnyk would never spend the money needed to bring additional good players in, and if by some miracle he did, they'd probably just end up benched so that Mark Fraser could add some much-needed grit to our top line. But I remain hopeful. The Senators simply have to be good again one day, right? RIGHT?? And when they are, I'll be able to say I was there the year that Dave Cameron literally lost his mind. Don't you want to be able to say the same? Of course you do! So don't wait for them to win a Cup! Join the Senators' fanbase now! Just use the five tips below and you'll be talking and acting like a true Senators fan in no time! Erik Karlsson is a 25-year-old who has already won two Norris trophies, and he's on pace for about ninety points this season. He must be a pretty good defenseman, right? WRONG. Whenever the Sens lose a game, Sens fans can be heard saying things like "KARLSSON'S GOTTA LEARN HOW TO PLAY D, LIKE BORO!" You can join in the conversation by adding something like "THEY SHOULD BE TRYING KARLSSON AT FORWARD, LIKE BORO!" This is great place to start, as these can be used no matter how well Karlsson actually played. You can take it a few steps further: "KARLSSON'S GOTTA SHAVE HIS HEAD, LIKE BORO!" or "KARLSSON SHOULD BE MORE FROM WHERE THE TEAM PLAYS, LIKE BORO!" or "KARLSSON SHOULD SPEND LESS TIME WITH BEAUTIFUL WOMEN IN EXCOTIC LOCATIONS, MAKING ME FEEL INCREDIBLY INFERIOR, LIKE BORO." Go nuts! Last year, when the Sens went on their miracle run to the playoffs, they were led by Andrew Hammond. This rookie goaltender, dubbed "The Hamburglar", put together a debut that broke all the debut records. ALL OF THEM. To celebrate, the Sens faithful tossed hamburgers onto the ice. Sounds so cool, right? But what about Craig Anderson, our long-time number one? What does he get? Well, it just so happens that we DO have a similar tradition for when Craig wins a game on home ice. 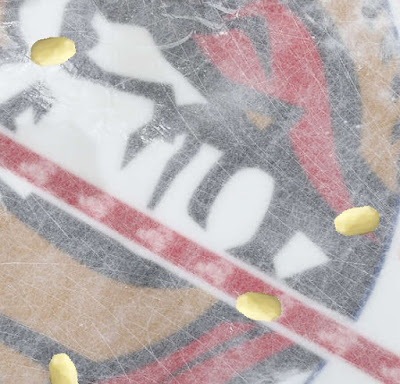 Rather than hamburgers, Sens fans shower the ice with peeled potatoes in a touching tribute to our netminder's beautiful bald head. Seriously, we always do this and it won't be weird if you do it at an upcoming home game. You want to be part of the fanbase, right? Please do it and send me a picture. When Bobby Ryan was acquired by the Senators, he famously stated that he was "COMING IN HOT". If you want to sound like a real Sens fan, you need to shout this all the time, regardless of the situation. Just walking down the street? Has your fighter jet been damaged and now you have to land it on a crowded aircraft carrier? Trust me, people are going to laugh and you will be popular. He's bad. Just talk about that. Mike Hoffman is a dynamic scorer, the likes of which this organization has rarely seen. Which is probably why they have no idea how to deal with him. Last summer, the Sens' brass refused to pay Hoffman after he put up 27 goals, insisting that he had to 'do it again'. This season, despite the fact that he's very much 'doing it again', they've cut his ice time and given his spot to a defenseman who isn't even particularly adept at defense, let alone offence. Yay! So if you really want to sound like a knowledgeable Sens fan, start comparing Hoffman to Marian Hossa. Just say stuff like "HE JUST REALLY REMINDS ME OF HOSSA... FOR SOME REASON" and then give a very animated wink. That way, when he signs with another team this summer and goes on to have a prolific career, you seem like a wise old sage.